One of modern Korea's most prestigious short story writers, Hwang Soon-won (1915-2000) dealt with characters of all ages and classes in his stories. Born near Pyeongyang in present day North Korea, he began his writing career at age 16, and published eight volumes of short story collections, seven novels and 104 poems during his lifetime. He is best known for the poignant short story "Sonagi" (Shower). 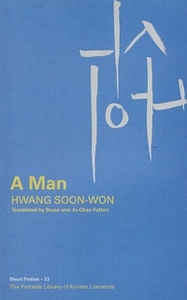 "A Man" contains his three masterpiece stories, including "The Dog of Crossover Village" and "Bibari." These pieces showcase Hwang's unique narrative style and artistic imagination. "The Dog of Crossover Village" (1948) describes the fate of an outsider in a hierarchical society and also portrays the tragic lives of Korean people and their endeavor to keep their nationality under Japanese colonial occupation. "A Man" (1954) offers wry commentary on gender relations by depicting a hapless fellow in relationships. "Bibari" (1956), a female diver, tells the story of separated families during the Korean War, offering glimpses of life on Jejudo, the island located off the southern tip of the Korean peninsula.